Baby-led weaning is a way of introducing solids without the use of purées. It might not be for all parents out there, but this method has really worked for our family. The long and short of it is you give your baby foods the parents would eat (in a safe manner of course). 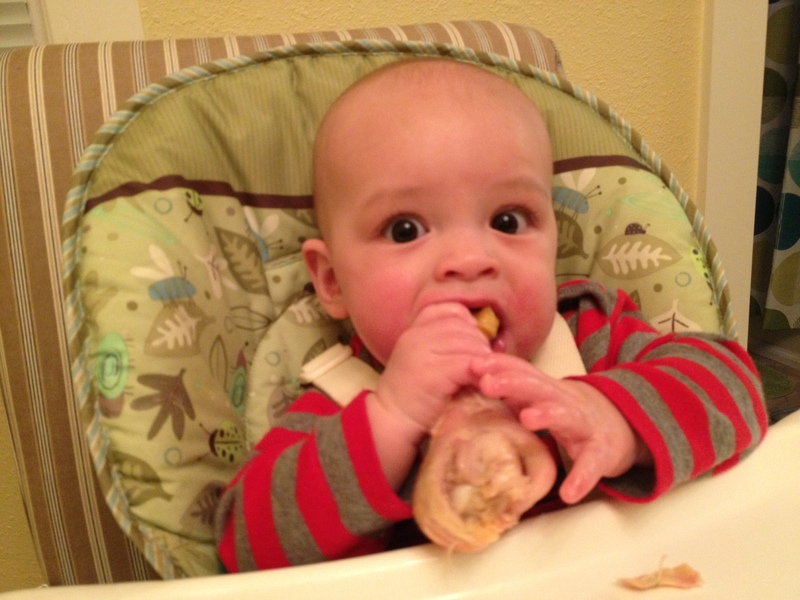 Babies are learning to eat the way they will for the rest of their lives, e.g. putting solid foods in their mouth and chewing. Learning doesn’t necessarily mean they are actually eating. In our case Baby Monster didn’t really start eating until closer to 10 months, although we would find the occasional rogue carrot in his diaper before that point. Like everything with a baby, one day it will just click that what they eat can fill them up. I love love love this method. The first 3 weeks on purées was a power struggle, and the power struggle was what finally made me try baby led weaning–we haven’t looked back since. There’s no extra meal prep and, most importantly, we eat meals as a family at the same time. It wasn’t easy, and the mess is about the same. In the end Baby Monster is eating the same as a baby who ate purées. He’s also picky, just like any baby who ate purées. But you know what, I wasn’t completely stressed out over mealtime. If you are at all curious, I recommend reading Baby-Led Weaning: The Essential Guide to Introducing Solid Foods – and Helping Your Baby to Grow Up a Happy and Confident Eater by Gill Rapley and Tracey Murkett.